Class assignment February 15 2012. “You want me to be somebody who I’m really not” went the chorus of M.I.A’s 2010 single XXXO. The British Sri Lankan rapper has never been one to compromise herself, something which NFL chiefs learned to their cost last Sunday. The Superbowl is almost sacred in America, and the half-time act is an opportunity for a global star to give a ten-minute concert. Madonna did an uncontroversial run-down of her hits with the assistance of some of 2012’s biggest names: Cee-Lo Green, LMFAO and Nicki Minaj. It was during the performance of her Madgesty’s new single, Give Me All Your Luvin’, with the aforementioned Minaj and M.I.A herself that the latter earned America’s opprobrium. For M.I.A., seemingly having forgotten Janet Jackson’s 2004 wardrobe malfunction, flashed her middle finger to the crowd- and the cameras. 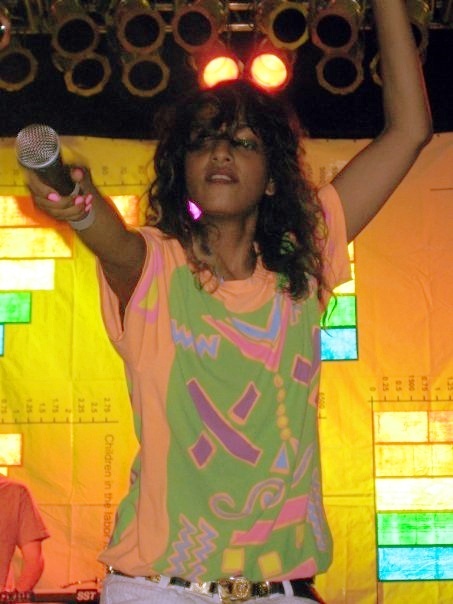 M.I.A has since blamed the incident on nerves. “She wasn’t thinking,” a source close to the rapper said. “It wasn’t any kind of statement. She was caught in the moment and she’s incredibly sorry.” If offending America wasn’t bad enough, there are rumours flying around that the incident was the last straw for her fiancé Benjamin Bronfman- or the finger was aimed at him. MTV says the star goes up to six weeks at a time without seeing their three year old son, Ikhyd, who reportedly lives with Bronfman in New York. Apparently Bronfman has moved on from their relationship and has been seen on a date with a “beautiful woman”. Madonna is said to be furious with M.I.A for her lack of professionalism. And the cherry on top? The Federal Communication Commission (FCC), the US media regulator, will fine her personally for her actions. A lesser woman would no doubt crumble under the weight of such a horrendous week. ButMathangi “Maya” Arulpragasam is made of sterner stuff. Born in Hounslow in 1975, to Sri Lankan Tamil parents, M.I.A spent the ages of six to nine in war-torn Sri Lanka. The official story M.I.A tells is that her father, Arular, was a Tamil activist during Sri Lanka’s bitter civil war. He had met up with fellow Tamils in London and became involved in the underground movement against the Sri Lankan government. “He went out to buy a pint of milk and didn’t come back for four months,”she recalled. In fact he had gone to train with the Palestinian Liberation Organisation. The family moved back to Sri Lanka and Arular helped co-found a student revolutionary group, EROS. He was a shadowy figure in her childhood- moving between safe houses, he was sometimes introduced to her and her older sister Kali as their uncle. Arular is now living in London and heading up the Global Sustainability Initiative, after a period in India. He mediated in talks between both sides in the late 1980s. The ambivalent attitude to her father exemplifies M.I.A as an artist. She is a mass of contradictions; Lynne Hirschberg’s 2010 New York Times interview showed her as naïve, po-faced and dumb- the type of person to eat a truffle-flavoured French fry while pontificating about the genocide in Sri Lanka. That particular piece infuriated M.I.A: she took to Twitter to vent her anger at Hirschberg. She even posted the journalist’s phone number online. Such guerrilla tactics are nothing new to her. Moving back to a council estate in London at the age of 10 was a shock. She has described the jolt of going from shot at in Sri Lanka to being spat at for being Pakistani. The young Maya didn’t speak English but she learned quickly, through school, TV and music like Madonna. Despite her difficult childhood, M.I.A stayed firmly on the rails, winning a place in St Martin’s College of Art and Design. Her first love was undoubtedly art. She’s still a visual artist- designing her own stage costumes, album artwork and gig backdrops. The clashing, busy covers of her three albums- Arular (a picture of her, mouth slightly open, her name and album title splashed in neon green letters), Kala(Soviet-hatted, donning sunglasses, she exhorts her listeners to “fight on”) and /\/\/\Y/\ (all but her eyes obscured by YouTube player bars) are reflections of her music- busy, jarring, full of samples and sometimes discordant, but insanely catchy and bright. 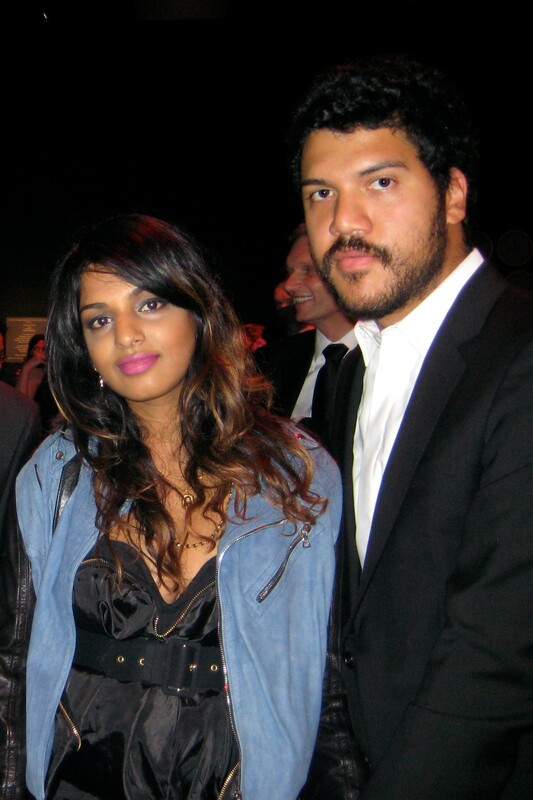 MIA and her ex, Ben Bronfman (via Wikimedia Commons). She admits freely that she’s not very musical and got into music by messing around with a Roland MC-505. It belonged to Elastica’s Justine Frischmann, who M.I.A designed an album cover for. It was around this time she began to style herself M.I.A.- a pun on her name, but also standing for Missing in Action… or Acton. One of the first songs she recorded was Galang, an epic seven-minute rap beginning with “London calling, speak the slang now…” and finishing with a rap on the consumerism and racism of British culture. It was the sound of London in the mid-00s, and M.I.A was one of the first to use the internet to promote her music. It was the sound of the future, according to rapper Nas. In 2003, an independent record label seized on Galang, and it became an underground sensation. Using hitherto unthought-of channels of distribution- clubs, college radio stations, file-sharing and MySpace- M.I.A’s first singles-Sunshowers, Bucky Done Gun and 10 Dollar– became sensations. A 2004 mixtape, Piracy Funds Terrorism, was released on a non-label format. Arular, her debut album, met almost universal acclaim when it was released in 2005. There was no difficult second album syndrome for M.I.A. 2007’s Kala met similar critical acclaim. Its sound was richer and fuller than Arular’s, with the second single Jimmy sampling the Bollywood song Jimmy Jimmy Aaja to the effect of insane catchiness. M.I.A’s biggest commercial success came with Kala. The song Paper Planes grew bigger legs than the artist herself could have imagined possible. “Paper Planes is my underdog song and it’s about the underdog and it’s when I felt like an underdog, but it’s become the biggest song,” she has said. Her career arguably peaked at this stage- she was nominated for an Oscar for the songs she contributed to Slumdog Millionaire and a Grammy for Paper Planes. She famously performed at the 2009 Grammys on her due date, and gave birth to her son Ikhyd days later. In early 2010, the video for M.I.A’s first single from her third album /\/\/\Y/\, Born Free, premiered on YouTube, earning, almost immediately, a ban. It featured a SWAT team hell-bent on exterminating redheads in ever-violent ways, and was seen as comment on the “absurdity of genocide”, according the Huffington Post. There was more backlash to come however. Some critics saw /\/\/\Y/\ as self-indulgent and over-experimental- Steppin’ Up, for example, featured power tools as a backing for the verses. Its summer release was also overshadowed by Lynne Hirschberg’s piece in The New York Times. But M.I.A., though quiet of late, has not disappeared. The Superbowl controversy aside, the singleGive Me All Your Luvin’ with Madonna and Nicki Minaj made the top 20 in the US Billboard charts, and another collaboration with Madonna in her upcoming album, MDNA. Whether or not Madge forgives her, it’s unlikely to make a difference to the Sri Lankan rapper. Her own new single Bad Girls released and charted at the end of January. A far simpler and catchier affair than anything on /\/\/\Y/\, it’s a taster of a fourth album due in the summer. A middle finger will not be the last any of us hear of M.I.A.